The two most important words you need to know to understand the fate of our coastlines are “grounding line.” Those words describe where Antarctica’s voluminous ice shelves begin to float, holding back a wall of ice on land. A study published on Monday in Nature Geoscience is among the first to create a detailed snapshot of how warming ocean waters are eating away at grounding lines around the continent. Over just five years, the continent lost 564 square miles of grounded ice, an area equivalent to roughly 25 Manhattans, 12 San Franciscos or four Philadelphias. This is not good news for any of those or other coastal cities. The scientists used satellite data that tracks minute changes in ice elevation from 2011-2016 to spot grounding line changes. 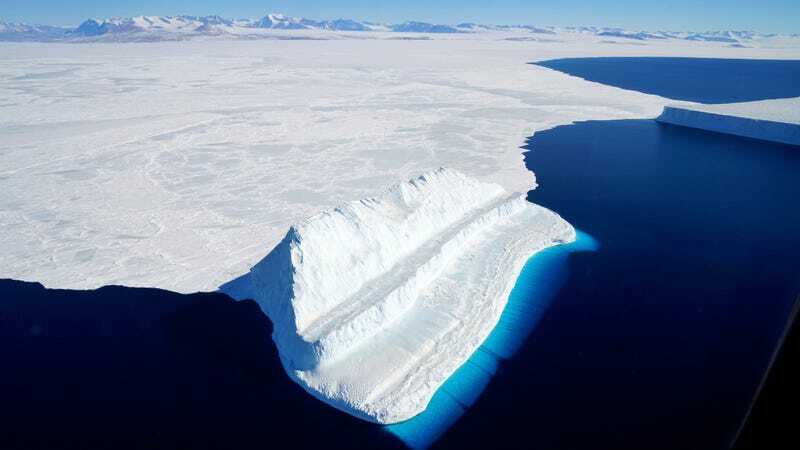 They found that in West Antarctica, 22 percent of the ice shelves have been receding faster than average since the last glacial maximum ended, roughly 16,000 years ago. The same was true for 10 percent of the ice shelves around the Antarctica Peninsula—site of the now-famous Larsen C iceberg which broke off the peninsula last July—and three percent of East Antarctica ice shelves. The latter are considered to be stable, though there have been a few worrying studies in recent years indicating that they could still face some troubles in a hotter future. A map showing ocean temperatures and grounding line movement. The red arrows in West Antarctica illustrate the rapid retreat taking place in the region. The findings reinforce the notion that a warm water assault is hitting West Antarctica the hardest, and shed light on some rarely-studied glaciers and ice shelves in the region. “We now have a first estimate of the speed of retreat (or in places also advance), as for example in Getz,” Hannes Konrad, an Antarctic researcher at the University of Leeds who led the study, told Earther in an email. Getz refers to the Getz ice shelf, one of West Antarctica’s smaller hunks of floating ice. A study published in February also documented changes in the glacier’s flow rate, indicating that little-studied ice shelves are starting to get more attention as scientists’ understanding of ice and satellite coverage improves. But don’t worry, the scientists also cover the big glaciers, too. Previous research has also shown that warm water is much further inland than scientists previously thought in some areas of West Antarctica, like the the Thwaites and Pine Island glaciers. These areas have been dumping big icebergs into the sea for awhile now, and they’ve been thinning out. In the somewhat good news department, the new study shows that Pine Island Glacier, the fastest-shrinking glacier on the planet, has actually seen its grounding line retreat slow down markedly compared to measurements taken from 1992-2011. Of course, it’s still retreating, so that’s not exactly heartening. And Konrad said that this might just be a temporary pause while warm water tries to find a way further inland. “Konrad and colleagues have extended a method that has promise for future monitoring of ice discharge into the ocean on a continent-wide scale,” Ryan Walker, a NASA ice researcher, wrote in an accompanying review piece. Which should be extremely helpful for those of us interested in learning where the water is going to come from next.